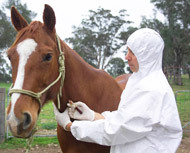 NSW DPI veterinarian testing a horse for equine influenza during the 2007-08 outbreak in NSW. NSW is EI-free, thanks to horse owners, industry and the public whose assistance during the 2007/08 outbreak allowed NSW to achieve a monumental victory over this disease. Travelling Horse Statements and event registrations are no longer required in NSW. However, it is adivsable that the event guidelines be followed. From 1 January 2009, horse event registration in NSW is not required. However, it is adivsable that the event guidelines be followed. See Horse events.